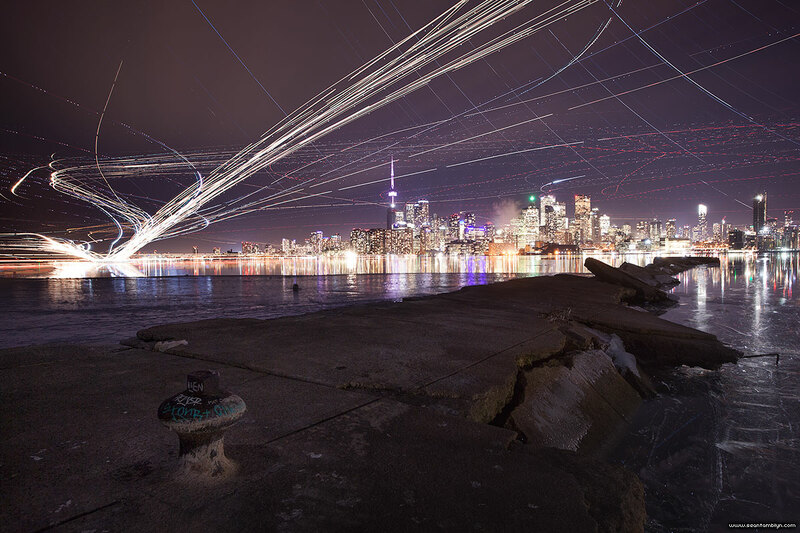 Aircraft streak over the Toronto skyline in a multi-hour exposure. Click image to view larger. This entry was posted on Tuesday, January 30th, 2018 at 11:05 pm. It is filed under Lagoon Report XXXIII, Lagoon Reports, Long Exposure, Technical and tagged with Canon EF 17-40mm f/4 L, Canon EOS 5DmkII. You can follow any responses to this entry through the RSS 2.0 feed. This is excellent! I might try something similar this weekend. How long did you leave the shutter open on each exposure, and how long in total did you stay to capture all of the exposures. Those are eight-second exposures, over the course of about six hours. Only really possible in late December and early January, when the sun sets early.